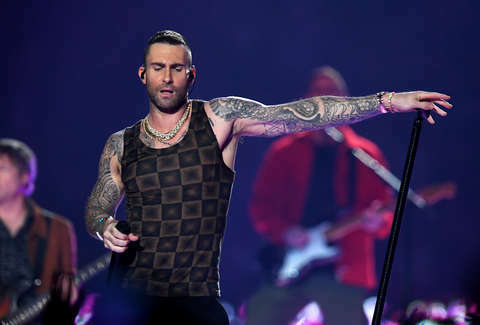 After the NFL was turned down by a number of performers for its stance on the player kneeling controversy led by Colin Kaepernick, the League settled on Maroon 5 as the headliner for the Super Bowl LIII halftime show. There was even some bonus controversy that the League didn't select any of the many great artists from Atlanta, where the game was played, to headline the event. When the big game rolled around, Maroon 5 took the stage to play some of their biggest hits with (very) brief interludes from Travis Scott (introduced by SpongeBob SquarePants) and Big Boi. The reaction to the band's performance was not positive. Social media was awash with jokes about the performance, Adam Levine's tracksuit, Levine's lack of clothing later on, and SpongeBob's brief appearance sans "Sweet Victory." Here are some of the funniest reactions to the 2019 Halftime Show on social media. yeesh if this is what they came up with for Maroon 5 I don't even want to know what Maroons 1 through 4 sounded like. The band was even used to take a potshot at the low-scoring game. The guy from Train has been working out. Yeah. A lot of people don't have this year's performance ranking among the all-time best Halftime performances.